The Somenos Marsh Wildlife Society undertakes projects that improve the ecosystems in and around the Somenos Marsh through scientific monitoring, ecological restoration and raising public awareness about their value. Community volunteers are key to the success of all of our projects. The Somenos Marsh Wildlife Society and the Cowichan Land Trust are teaming up to work with landowners and other community partners to help address water quality issues in Somenos and Quamichan Lakes through a new project called the Somenos and Quamichan Lakes Clean Water Action Project. The Somenos and Quamichan basins are both important parts of the lower Cowichan River, a designated Canadian Heritage River, in the Cowichan Valley on Southeast Vancouver Island, BC. This aquatic ecosystem supports Coho Salmon (Oncorhynchus kisutch), Chum Salmon (O. keta), Chinook Salmon (O. tshawytscha), Rainbow Trout (O. mykiss) and Cutthroat Trout (O. clarkii) among many other native species associated with this ecosystem. Water quality and habitat in the lakes have degraded over the past century and a half due to harmful land use practices including agriculture, forestry, and urbanization. Collectively over time these practices have led to poor water quality, damaged wildlife habitat and decreased human recreational opportunities. Persistent summer blue-green algae blooms now also pose a direct threat to animal and human health. Symptoms of the water quality problems in these lakes are eutrophication and toxic algae blooms, which have caused the deaths of several pet dogs of residents around Quamichan Lake in recent years, and the recent infestation of Somenos Creek by the invasive aquatic plant species Parrot’s Feather (Myriophyllum aquaticum). Through the Somenos and Quamichan Lakes Clean Water Action Project the project team will work to improve water quality in the Somenos and Quamichan Basins through riparian restoration actions, landowner contact and community engagement over three years starting in 2018. If you are interested in getting involved in this project as a resident or volunteer please get in touch with us at programs@somenosmarsh.com or 778-401-8460. We are gathering information about resident’s water quality experience and common practices around the lakes. Please visit our survey link to contribute important information for this project. Water quality monitoring has been ongoing in Somenos Lake since spring 2014. Weekly during summertime and monthly during the winter volunteers measure water temperature, dissolved oxygen, pH, dissolved solids, specific conductivity and water clarity. Data loggers are installed in the deepest part of the lake, with one data logger at the surface, one at mid-depth and one near the bottom measuring water temperature once an hour. This project provides crucial information on water quality throughout the year which affects all ecological aspects of the Somenos Basin. By identifying water quality issues, studies and management plans can be developed and executed to improve these conditions. Historically, Somenos Lake has provided critical year round habitat for salmonids within the Somenos Basin. Currently however, it only provides suitable habitat for 6 months of the year in winter. This is due to high temperatures in the upper water column and anoxic conditions (low levels of dissolved oxygen) in the lower water column during the summer. Poor water quality has led to prolific cyanobacteria (blue-green algae) blooms during the summer which becomes consumed by aerobic bacteria, which utilizes dissolved oxygen. This creates an anoxic environment unsuitable for salmonids. In summer 2018, the Somenos Marsh Wildlife Society received a generous donation of $8100 from 100 Warmland Women Who Care. In our application for this funding we emphasized the precarious state of salmon habitat in many parts of the Somenos watershed. 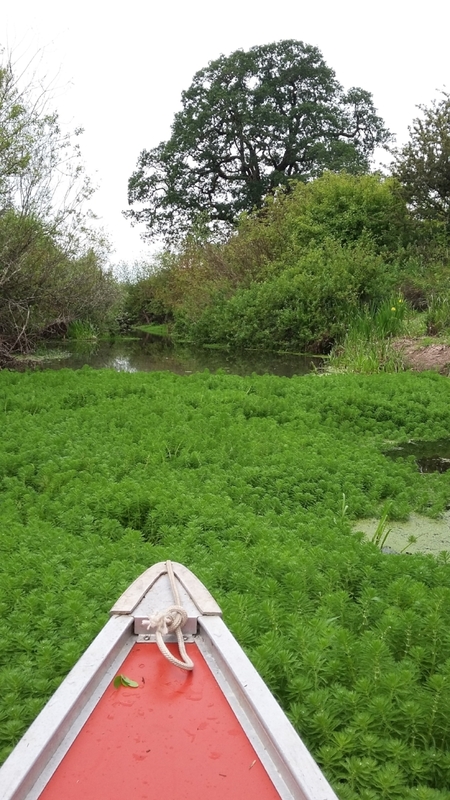 One of our gravest concerns is the deleterious effect of Parrot’s Feather: an invasive aquatic plant that has come to dominate much of the channel in Somenos Creek. Parrot’s Feather grows in such abundance and density that it can create a physical barrier to the of movement salmon as they migrate through Somenos Creek as adults to spawn or as juveniles on their way to the ocean. Parrot’s Feather aggregations also threaten Rainbow Trout and Cuutthroat Trout in Somenos Creek by creating areas of dangerously low oxygen. The funding from 100 Warmland Women Who Care will be used to initiate a research and monitoring program to control Parrot’s Feather in Somenos Creek. Our first task will be indexing and mapping present Parrot’s Feather aggregations in Somenos Creek and comparing these data to our first survey completed in 2017. This data will then be used to develop an investigation into approaches to Parrot’s Feather control. The research will focus on ways that shading can be used to limit Parrot’s Feather growth, persistence and spread in different reaches of Somenos Creek. We will identify candidate patches for shading experiments so that we can compare different shading practices (e.g., weighted pond liner, gardener’s cloth, and riparian planting) with control areas where Parrot’s Feather is allowed to grow in an uncontrolled manner. The results from this research will be used to help inform a Parrot’s Feather management plan being developed by the Municipality of North Cowichan. This program will help protect and rebuild salmon and trout populations in the Somenos Watershed. Click here to view a drone video of Parrot’s Feather in Somenos Creek in February 2016. The Somenos Basin constitutes some of the most valuable habitat in Cowichan for culturally and commercially important fish species including Coho Salmon (Oncorhynchus kisutch), Chum Salmon (Oncorhynchus keta), sea-run Cutthroat Trout (Oncorhynchus clarkii) and Rainbow Trout (Oncorhynchus mykiss). A long history of agriculture and urbanisation around Somenos Creek has led to a substantial amount of degradation to this fish habitat. One of the primary limiting factors for fish production in Somenos Creek is summer water quality, partially due to historic clearing of riparian vegetation which, decreased crucial shade and bank stability. Salmon need a specific water temperature range to thrive and survive. Cooler water temper also holds more oxygen, another essential environmental factor for salmonids. Tall riparian (near water) vegetation along creeks provides essential shade keeping the water these fish call home liveable. In 2017 the Somenos Marsh Wildlife Society and their volunteers planted over 1800 native trees and shrubs along the banks of Somenos to begin the process of restoring this important salmon habitat to ecological health. Over the next few year these plants will grow to shade the creek improving water quality and providing important habitat for fish through insect drop and large woody debris additions. Our goal is to continue to work with our partners and volunteers to restore the riparian zone of Somenos Creek for Salmon. Sign to volunteer to hear about work parties. Big thanks to our funders, and partners and supporters. DFOs Recreational Fisheries Conservation Partnerships Program, Cowichan Tribes, The Municipality of North Cowichan, The Vancouver Island Conservation Land Management Program, Dave Polster Environmental Services, Nature Trust BC, Cowichan Land Trust, Dave Preikshot, Saanich Native Plants and . This work would not be possible without our valuable members and volunteers. Thank you! 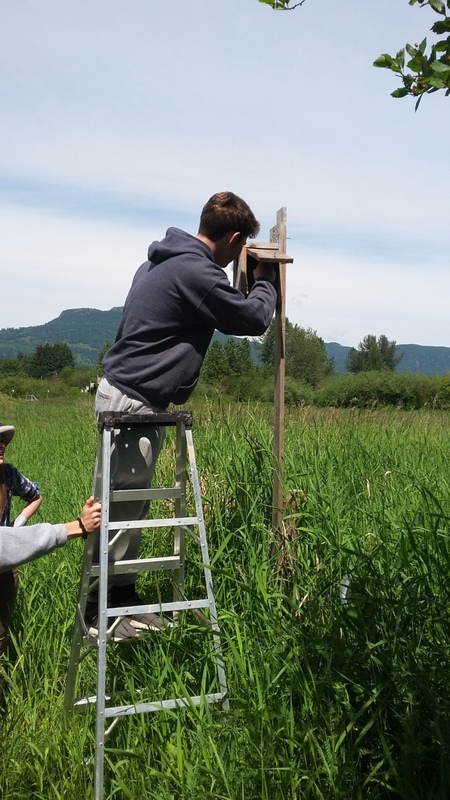 The Somenos Marsh Wildlife Society, with funding from the Municipality of North Cowichan and the National Wetlands Conservation Fund, is wrapping up a two year program to restore a one hectare wetland area near the intersection of Beverly Street and the Island Highway. 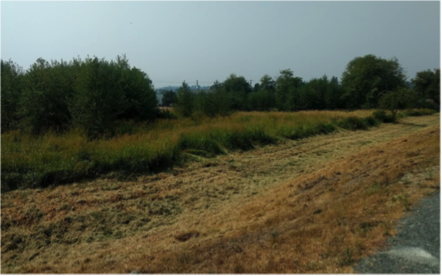 In years past, folks walking along the Beverly Street Dike west of the former “Fun Pacific” property would have seen a flat open field dominated by invasive plants like Giant Manna Grass, Reed Canary Grass, and Thistles. Our goal is to restore this site as a wetland supporting increased biodiversity of native plants and animals. This project also holds economic value by providing pollution remediation of runoff storm water and decreasing the stress on flood management systems near the dike. In addition a restored wetland significantly improves the aesthetic value of lands in an area subject to significant commercial and residential development. Under the supervision of Robin Annschild, a local wetlands restoration specialist, Pontious Brothers Trucking and Excavating built 6 ponds and several uplands areas in early September 2017. During the winter of 2017/2018, the Somenos Marsh Wildlife Society and local volunteers planted over 1000 native trees and shrubs in upland areas and herbaceous plants in lower wetted areas. Ponds and their fringes were seeded with hundreds of Cattails. By the summer of 2018 a decline in the abundance of invasive plant species was noted. We have observed a good survival of native plants and animals including waterfowl and fish have already begun to colonize the ponds. Soil samples from the wetland are being analysed to determine how it is working as a way to remove pollutants from runoff water. This project serves as a useful model for the creation of wetlands that provide environmental, social and economic services in local urbanised areas. The Somenos Greenway Project will identify, protect, and restore aquatic and riparian corridors used by fish and wildlife and plant species in the watershed. Many rely on these corridors to complete crucial phases of their life histories. For example, Coho Salmon adults rely on upstream spawning habitat in the Tributary Streams, Bings, Menzies, Richards and Averill. Coho Salmon juveniles rear in lower stream habitats on those creek as well as Somenos Creek. Historically juvenile Coho Salmon used Somenos Lake as a rearing and staging area for their seaward migration. Adult and Juvenile Salmon use Somenos Marsh, Lake and Creek as a migration corridor. Many other species use parts of the Somenos Greenway in order to grow and reproduce. The Greenway has long been a goal of the SMWS and we are fully expecting that it will long and involved project for the Society. The project will be carried out under the supervision of SMWS staff ecosystems scientist Dave Preikshot (PhD, RPBio). Dave is an aquatic scientist with extensive experience researching and monitoring ecosystems and fish in the Salish Sea region, and the Cowichan Valley. This project described here can be thought of as Phase 1 of a complete Greenway project, stretching from Mt. Prevost to Somenos Lake. This investigation would therefore have a focus on stream and riparian habitats in Bings and Menzies Creeks. For Phase 2, SMWS will work with Cowichan Tribes on continuing to survey and develop the Greenway concept into other tributary streams, Somenos Lake, Somenos Creek and Cowichan Bay. Throughout the project, SMWS will work in collaboration with Cowichan Tribes to incorporate traditional cultural, historic, and environmental knowledge of the greenway into the survey and other products, including linguistic information to describe species and habitats in the greenway. The project will also feature extensive collaboration with partners from other environmental service organisations, such as the Cowichan Valley Naturalists, the Cowichan Valley Land Trust, The Cowichan Watershed Board, and the Cowichan Estuary Restoration and Conservation Association. SMWS will seek information and advice from municipal, provincial and federal agencies that have conducted research and monitoring in the Greenway, such as North Cowichan Engineering; the BC Ministries of Environment & Climate Change Strategy and Forests Lands, Natural Resource Operations & Rural Development; Environment Canada; and Fisheries and Oceans Canada. We have been working to restore native ecosystems within the Somenos Marsh Conservation Area (SMCA) to increase biodiversity that is under threat. We host volunteer events to remove invasive plants, plant native shrubs, wildflowers and grasses and raise awareness of the important ecosystems of the conservation area through educational community events. Most people know the marsh for its diversity of birdlife but how many know about the at-risk plant species that also call Somenos home? Two examples of these species are Tall Woolly Heads (Psilocarphus elatior) which are red-listed and Vancouver Island Beggarticks (Bidens amplissima) which are blue-listed. The SMCA currently has several exotic invasive species (an introduced plant or animal which causes a negative impact on the environment due to the lack of their natural predators, competitors and pests). Did you know that invasive species are the 2nd leading cause of biodiversity loss worldwide according to the International Union for Conservation of Nature (IUCN)? Yellow Flag Iris (Iris pseudacorus) and Purple Loosestrife (Lythrum salicaria) are a couple of examples of invasive species which have appeared in the wetland. If left unchecked, these invasive species populations can expand and cause a large impact of the expansive biodiversity found in the Somenos Marsh Conservation Area. Sign up to our volunteer list to hear about upcoming volunteer events where you can get involved with improving the biodiversity of Somenos. A big thanks to Environment and Climate Change Canada for their funding and in-kind support from BC Wildlife Federation Wetland Education Program, Vancouver Island Conservation and Land Management Programlan, Cowichan Tribes, Cowichan Valley Regional District, Municipality of North Cowichan, Cowichan Community Land Trust, Saanich Native Plants, Cowichan Valley Naturalists Society, Nature Conservancy of Canada, our members and Community Volunteers. 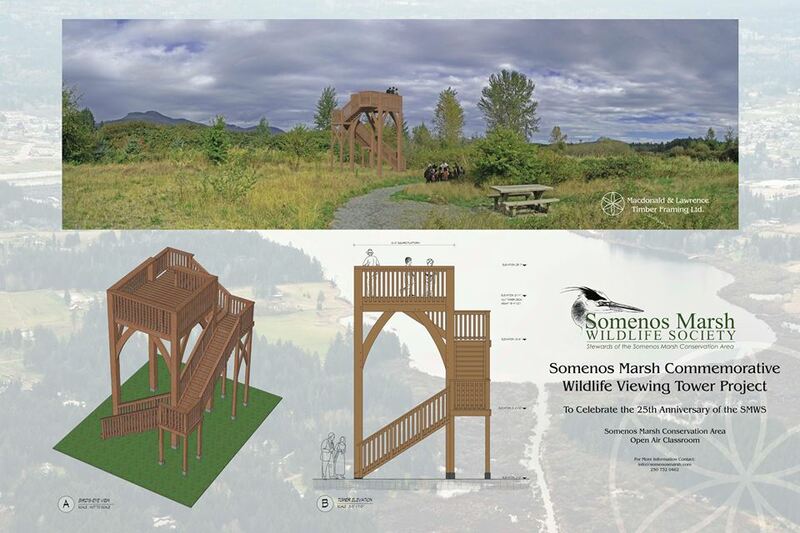 The Somenos Project Nest Box has existed since the early 1970s and was originally established by the Cowichan Valley Naturalists Society, instigated by one John Comber. It gained strength in the 1990s when longtime birder and naturalist Derrick Marven installed many more boxes on fence post extensions throughout the marsh. Maintenance over the years has consisted of cleaning out old nests in the fall after the breeding season, occurring every few years, often with the help of student groups. Over the years many of the boxes have become unusable to birdlife due to weathering and vegetation encroachment. Some boxes were also recently removed as part of a municipal diking project. Because of this reduction in usable nesting habitat it has been decided that new boxes are needed. There has also been interest in setting up a more formalized monitoring program to begin gathering data about the species that use the boxes and submitting it to a national bird data tracking program. Project NestWatch has been investigated and deemed to be a suitable program to participate in with students. As swallow species continue to decline across Canada this data will be valuable for the conservation effort. School groups and others often get involved in this project through hands on learning opportunities that are valuable for students who will hopefully grow to be the stewards of the future. The Somenos Marsh Conservation Area (SMCA) Open Air Classroom (OAC) is a self-learning trail and boardwalk system that extends into Somenos Marsh providing wildlife viewing, nature observation and environmental education opportunities. The OAC viewing tower is the last wildlife viewing infrastructure planned for the once industrial property. The tower's purpose will be to provide a 360 degree view of the marsh as well as the nearby urban environment and will also provide an elevated classroom setting to present important ecological services messaging via interpretive signage to school groups and other visitors. Continuing our practice along the boardwalk, interpretive signage will be written in both English and Hul'qumi'num languages in respect of the Cowichan People who were first here. There will be a dedication sign at the base of the tower listing the names of all those who contributed towards the project. This project is awaiting final permitting and construction is planned for spring 2019. We thank TimberWest for their generous contribution to this project. WildWings began in 2009 as the Return of the Swans Festival, changed to the Cowichan Swans Festival in 2011 and finally morphed into WildWings in 2012. Late fall is a special time of year in the Valley because it marks the return of migratory waterfowl to their overwintering habitat in the Somenos Marsh and nearby natural areas. The Trumpeter Swan, the largest of North American waterfowl, was once brought to near extinction. WildWings Festival is a celebration of this beautiful bird’s annual return to Somenos, their resting place, from their northern breeding grounds. The Somenos Marsh Wildlife Society (SMWS) coordinates the informal WildWings partnership of nature groups, local businesses and volunteers, who host events related to local nature and culture. To find out about past festivals please visit the WildWings Nature & Arts Festival website. Visit the Facebook page to get news about the next festival.